Great show last night at the Pageant in St. Louis. 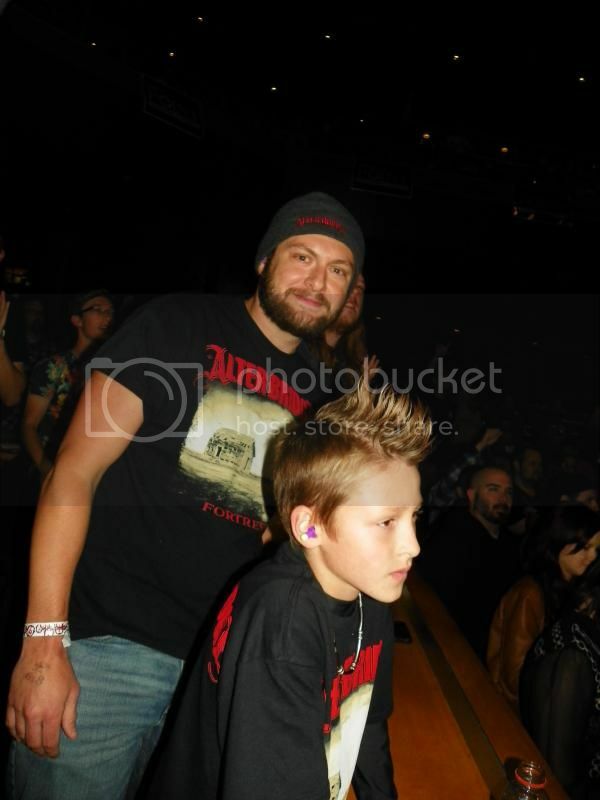 As most of you know, I took my wife and my 9 year old son (his first concert). It was our first time at The Pageant, and let me tell you, it's a wonderful venue. Probably 1,500 there last night, mostly full. And the boys were in rare form. We decided not to do VIP this time. 450 bucks for all three of us is kind of steep. But the pageant has an early entry program, where if you show up before 5 pm, you can get a bracelet that let's you in right after the VIP's. Not knowing how big a deal this was (and always being early for everything) we showed up at 3:15. We got in 1, 2 & 3 needless to say, as only 20 bracelets were handed out. I felt really stupid after the fact. But hey it's AB. The Cringe were ok at best. The vocals were WAAAAAAAY too loud. I had earplugs in for the first two acts, and the Cringe's set really rang in my ears. The first song was pretty good. They closed with a cool version of Comfortably Numb. California Breed were amazing. I saw Glen Hughes walking around by the buses when we were walking to the venue, but he was gone before I could get my camera ready. They were amazing and had tons of energy. The crowd was totally into them. That man can scream. Then AB came on. ATP, White Knux, CTL, and then they went into All Hope Is Gone. I had my wife video it, as I haven't seen too many of them on this tour. I love the song and AB III, and could have went home right then and been happy. No other surprises, seven BB songs, 4 Fortress, 4 ODR, and 3 AB III. I was happy that I finally got to hear Watch Over You live. This was my 3rd time seeing the band. The first was a C.o.M date in '11. The 2nd was earlier this year when they weren't playing the tune. So I was happy we got it. Myles Kennedy. Holy crap! They said he was under the weather for most of the first leg of US dates. I concur after seing him last night. He was wailing on every song. He told us a story of his first ever concert going experience, seeing Sammy Hagar, and went on and on, eventually telling us the story was going nowhere. He told us about going record shopping earlier in the day down the street from the venue. He was far more active than I have ever seen him, and looked like he was having a blast. They played some funk rifs before Isolation that we all played along with before we got the AB III-esque "WTF WAS THAT?" Myles wasn't the only one having fun. I missed what Brian did to Flip, but at the end of the show when they were throwing out guitar picks (my son got a Dunlop, I'm assuming it's Myles' as Marks have his sinature on them) Flip turned and fired one as hard as he could at BMarsh for pulling some kind of chicanery. All in all, this was probably my favorite show that I've seen even if we only got 4 Fortress tracks. But I'm easy. I'd sing along to BTC 16 times if that was the gig. My son had a blast and can't wait until next time (which I regretfully had to tell him will be in about 2-3 years on the next cycle). Here is a video that someone took directly behind me. I'm rocking out in my AB beanie like a fool in every one of his youtubes. I'll post mine once they are all uploaded. Awwww, great photo. Your kid looks like he is really immersed into the show. Yeah. He enjoyed it. I have to get him to learn to loosen up more. But he did sing along and headbang at the heavier songs. Re: Or my crappy ears. Thanks guys. I love sharing concert experiences. This was a great one.